Prior to and throughout recorded history human beings have been arguing and fighting about the space between us all. The space between us all is neither a vacuum nor solely metaphorical. It includes real irreplaceable things such as the air, water, land, and other resources of our planet. This website pays particular attention to the stuff under our feet. We live on and from a thin layer of precariously-watered soil which formed from weathering rocks and decaying organic matter over millions of years and which human beings are capable of eroding and depleting in a geological second and have never figured out how to share for the common good. We need to start thinking and talking more lovingly about this space and each other’s place in it so that we can identify and do just and rational things to deal with our shared space plight. A landscape by a radical as a young boy, with part of the sixth socialist commandment and the name of his current creative landscape. 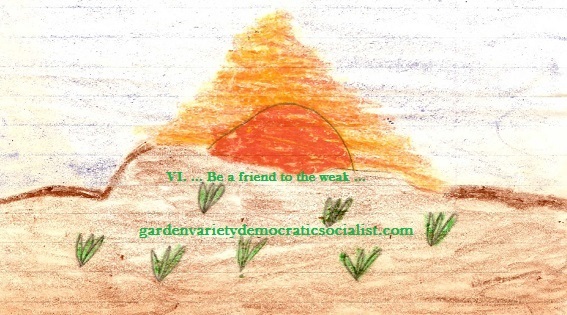 gardenvarietydemocraticsocialist.com is maintained by “Francisco Nejdanov Solomin,” a democratic socialist soil scientist who is also a half-Hispanic pro-choice Christian contemplative living in the ever-tolerant Deep South of the U.S. This website is a serious effort, but he has not obtained a stylish professional design for it to advance this notion. This is not a digital place to impress you or generate “likes” or comments (good thing!) but hopefully a quiet part of where we are to slow down and ponder a better world. This website, like Brother Francisco’s socialism, is not about perfectionism or a quest for utopia. The world is complex and under a lot of constraints even were it not for capitalism. Francisco wants to do his best as a species-being (which as a child meant coloring the above picture for his bereaving Granma), but he himself is under constraints, as are you. For now, with other responsibilities begging for attention and repression against socialists a serious concern in Tea Party Land, supporting and engaging in workers’ gardening and virtual activism are about all that he can do for the great social project (beyond conventional party politics). The result is gardenvarietydemocratisocialist.com, a pseudonymous, volunteer, mostly amateur work of solidarity. Please pardon its dust (and illeism). When dust settles, it can be a valuable component of our soil, and growth may ensue. Today culture is formed in new ways that potentially allow anyone to make a positive difference around the world. So Brother Francisco decided to wash his hands more often and try typing, joining in the digital cultivating. Now this little starter kit website is read by (two or three!) people all around the world. The solidarity we need to cultivate consists not only of macro-cooperation on a global scale but also small-scale efforts, such as workers’ gardens, where local soil becomes the medium for a more humane world. Even composting can be a political act. Brother Francisco has a message he wants to get out to others, and this website allows him to try his best to do that. Even if the message is seldom heard, it is fulfilling to try. We are each on this planet only for a little while, and it is dispiriting not to do our best with the time that we have. We should each do our best as species-beings, whatever that is. This website is the best Brother Francisco can do, for now at least, nothing more and nothing less. Because he grew up in a politically and religiously conservative U.S. subculture where “democratic socialism” was not even a term with which Brother Francisco was familiar, he particularly wants to make sure that all persons who come to this website know: (1) that he is serious about socialism and serious about democracy, and that learning that the two belong together has been extremely important to him; (2) that, for him, his religion is not an impediment but rather completely compatible with socialism; and (3) as he says on page 7 of Pamphlet No. 1, although he now is a deeply committed democratic socialist: “My party affiliation has not changed. I do not expect that it will. For me this is a matter of prudence in a winner-take-all jurisdiction, not ideal preference.” He is both a democratic socialist and an active member of the Democratic Party in the U.S., in keeping with the primary strategy of Democratic Socialists of America, which is an activist organization not a political party. Stepping out in some way for democratic socialism in the U.S. has not been this compelling for many decades (although repression against socialists is still very real, hence Brother Francisco’s use of a pen name for the time being) because of the obvious failures and inadequacies of the alternatives. Capitalist triumphalism, with its Milton Friedman global neoliberalism, is gradually showing itself to be a massive fraud perpetrated on humanity through transnational corporate “world citizens” fronting for the powerful capitalists. But, sadly, the “actually existing socialism” of Stalin’s Soviet Union and Mao’s People’s Republic of China made no credible case for a socialist alternative. Where totalitarian state capitalism masquerading as socialism once stood, now Russian oligarchs and Chinese princelings get rich through market capitalism. Faced with such uncertain terrain, all persons of good will, including sincere socialists, need to face facts. Among these facts, as Cornel West wrote: “Democracy matters” a great deal. Another: as Reinhold Niebuhr made clear, political democracy alone is inadequate to bring justice, but very good at making profits for the powerful capitalists. One way or another, Niebuhrian coercion must occur, but it will not be pleasant for the powerful capitalists, so it will not be at all easy to bring about. But bring it about we must. This website is a lot about assessing “where” we should be going from here. But in going on this journey, it is important to have a good idea of “how” to proceed. To Brother Francisco, that means going back to the old saying “honesty is the best policy.” That is why the first part of this website’s motto is “accepting life’s complexity.” To deny life’s complexity is a serious form of dishonesty. In Stalin’s Soviet Union and Mao’s People’s Republic of China, honesty was disregarded, and the results were disastrous, including the deaths of tens of millions of people. June 3, 2013 is an important day for Brother Francisco because it was the day he started writing Pamphlet No. 1. Rather than being a “news”-oriented blog, this website will primarily serve as a vehicle for providing free access to lengthy original writings by Brother Francisco, which will be published only infrequently. These writings will typically be called “pamphlets” and given a number representing the order of publication. They might be something useful for printing and sliding under the door of a potentially-interested person. (Hopefully you would print on both sides of the paper, but if you are reading this blog you probably do not need to be reminded of that! But even then Pamphlet No. 1 is so thick it could get stuck under the door.) Posts will be done when Brother Francisco believes he has something worth writing of a shorter length. This site also from time to time may publish writings from others who share an interest in democratic socialism; accepting life’s complexity; working for global stewardship of our soil and other resources to meet everyone’s basic needs; and being a friend to the weak. As explained in Pamphlet No. 1, Brother Francisco takes a broad approach to what is potentially relevant to democratic socialist thought, so his particular interests are not intended to be limiting. In accepting the complexity of life, we must make sure we are not treating others as invisible. The Blogroll for this site links to outstanding socialist websites that have been helpful to Brother Francisco as he has gotten in touch with his inner democratic socialist, although not all the sites self-identify as “democratic” socialist. The people who write at these other sites are smart and so far as he can tell, good as well. Some of these sites are much more scholarly than this site generally will be. As he discusses in Pamphlet No. 1, Brother Francisco is primarily not writing as a scholar, with the exception of topics relating to soil science where he may have some “expertise” that allows him to provide a certain level of scholarship. As to the critical issue of political democracy, one does not have to explore or agree with everything someone else writes to benefit from some of her or his information and opinions. Although political democracy is tremendously important to the future of socialism and hence humankind, many socialists are deservedly skeptical of the democracy-lite practiced in capitalist countries, where the economy is effectively not democratized. (And again, they can draw support from theologian Reinhold Niebuhr.) Opportunity may exist to explore dialogue with socialists who as yet do not prioritize political democracy, just as opportunity may exist to explore dialogue with political democrats who as yet do not prioritize economic democracy. Brother Francisco is willing to engage with anyone on these and other subjects. To learn about the “UN Millennium Development Goals,” please go to page 6 of Pamphlet No. 1, A Winding Path to Workers’ Gardens/Un camino de bobina a jardines de trabajadores, for links and a “reading assignment,” and look at posts at this website, including this and this. The entire Socialist Ten Commandments can be found at the end of the “anger management” webpage at gardenvarietydemocraticsocialist.com. I’m on the left wing of the possible. I write for the same reasons Eric Arthur Blair did, just not as well. I am a pro-choice Christian contemplative. Could be the chili, but I sense Jesus whispering to be radically committed to humanity. His reasoning in abandoning his original plan to keep the two pseudonyms separate is discussed in A Socialized Reflection on Repression in the Deep South by and for the 1%.